Hi, Everyone that is still around... all like maybe 3 of you. 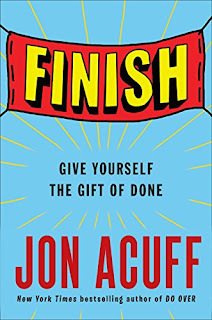 Life is crazy, and I've been such a crazy perfection driven goal setter in my life... if you don't know what I'm talking about... do yourself a favor and order Jon Acuff's newest book, Finish, it'll explain everything. The basic idea though is that we all set goals, and have this vision of getting them done perfectly. When perfect doesn't happen, we quit. If this isn't me... I don't know what is! If you haven't read any of Jon's books - be prepared to get inspired, and laugh a LOT. I have planned so many times to pick this whole blogging thing back up... and it hasn't gone perfectly, so I gave up on it. It's really sad too because I dearly love writing and the process of putting your thoughts down on "paper." The closer I get to 40, the more I'm thinking about the intentional things I do with my time. There are a LOT of things coming up in the next few months that I want to share with anyone that wants to read my words. I hope that you've had a great few months since my last round of posting, and I promise to be better. I am not going to commit to any specific timelines on posting, but I'm going to do my very best to be around as much or as often as I have something to share. This past week, we've had my younger son, Tyler's, 7th birthday party. As with most kids in that age group right now - it was a Minecraft themed party... so I plan to share some of the DIY items that we put together for the celebration. We made a pinata, the cake, and some fun balloon decorations. We felt okay in taking them on because "how hard can a bunch of pixelated things be?" Oh my friends... famous last words. We did manage to get it all done and a good time was had by all! I'll share about the party and a couple of the items we made tomorrow -- then more throughout this week. Next week, I want to tell you about a couple other things that are coming up quickly. One other quick thing, OurPact, one of the apps that we use on a daily basis with our kids is increasing their prices very soon for their premium package - which is what we have. This app is good for both Apple Devices and Android... but their monthly cost will soon go from $4.99 to 6.99 for the premium service. If you sign up - you get locked in at the $4.99 price rather than the higher one. They also have free versions and lower plans as well that you can choose from. **I am not getting any affiliate rewards or kickbacks for telling you about this - I just wanted to help save you some money if you're looking for a service like this. I've tried a few different ones, and this seems to be doing the trick for us.